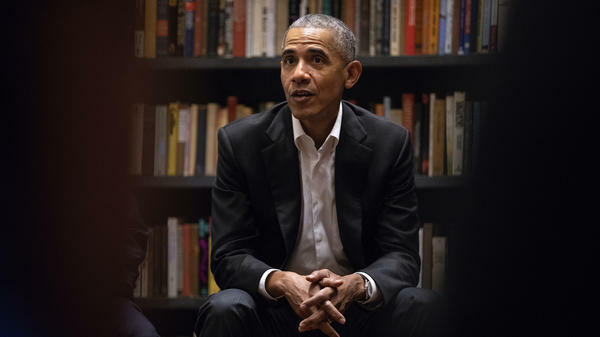 Former President Barack Obama, who spoke to Obama Foundation fellows in May, urged Democrats at a California fundraiser this week to get younger people involved in the process. Former President Barack Obama has kept a low profile since he left office. It was just a coincidence that the man who so inspires Democrats made one of his rare public appearances in Beverly Hills on Thursday night during what has been a mostly dispiriting week for members of his party. With Justice Anthony Kennedy announcing his retirement Wednesday, Democrats have had to face the fact that President Trump will get a second appointment to the Supreme Court. Meanwhile, the high court this week ruled against unions and upheld Trump's ban on travelers from several countries that are predominantly Muslim. And the outcry over the separation of migrant families at the border continued with no end in sight. So for a couple hundred well-heeled Democrats, Obama's Southern California visit couldn't have been more timely. They gathered in the garden of two major Democratic donors. There were really only two items on the agenda: soaking up that Obama inspiration and donating some major dough to the Democratic National Committee. Tickets started at $2,700 and went as high as $100,000, which bought five primo seats at dinner, a photo with the former president and a position on the DNC Finance Committee. It was a casual, interview-style appearance that lasted a little over 45 minutes. Obama wore a dark jacket and open-necked shirt. He shared the stage with DNC Chairman Tom Perez. Almost every moment of their discussion was geared toward Democrats' hopes for the upcoming midterms. Perez touted the victories that Democrats have already had in state and special elections. But Obama said, "I would caution us from extrapolating too much from a bunch of special elections." It would be a mistake to think that the momentum from a handful of wins would guarantee success in November, he said. "We have to get organized," said the former community organizer. "We have to get systematic about registering voters." How to motivate people to go to the polls was a major concern of the evening. Perez was especially concerned about turning out younger voters who were key to Obama's presidential victory but ordinarily are less likely to vote than older people. "The most important thing we can do," said Obama, "is invite them in and give them power. Give them a voice," he said. Older people tend to think that they know best. But Obama advised: "Get young people involved and get out of the way." And it's not just young people who must vote. "If people participate and they vote," said Obama, "then this democracy works." The one truly dark moment came at the beginning of the conversation, when Obama and Perez acknowledged the shooting earlier in the day at the Capital Gazette newsroom in Annapolis, Md., that left five people dead. "What happened in Annapolis seems to happen every few weeks and months," said Obama. "Each time one of these tragedies strikes, we remind ourselves that this is preventable. It's not inevitable." America is hardly the only country with troubled, violent individuals, he said, but "we are unique in the weapons these people can deploy." Turning to the larger political picture, Obama said, "This is a moment of great urgency. You are right to be concerned. The progress we have made is not a given." He urged them not to sit back waiting for a candidate who sweeps them off their feet. "Do not wait for the perfect message. Don't wait to feel a tingle in your spine, because you're expecting politicians to be so inspiring and poetic and moving." The former president said reaching voters was what is more important. "Worry about [if] we have organizers on the ground." The candidates who care about those things, he said, are the ones who are going to win.